This is another of those posts where I have to leave a disclaimer that I’m friends with the author and I’m proud to say I’m quoted inside this, so you can take whatever I say about the book, however, you want to, but the fact that I quoted for it, gives an indication of my thoughts already. We are back in Banktoun, which is the setting for her debut novel, Black Wood. It doesn’t follow on as such, but there are a couple of characters you recognise because it is a small town. And small town settings are wonderful places for crime fiction because of the closed in feel they can generate, and Holliday certainly makes the most of it in the fictional Banktoun. I loved meeting a couple of characters I already knew and I definitely enjoyed meeting the new ones. The main person you recognise from previous reading is the Sergeant, Davie Gray. 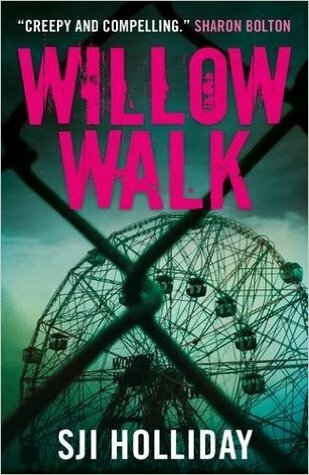 I thought Black Wood was creepy, but Holliday ups the creep in Willow Walk, ten-fold. Some of the new characters you really wouldn’t want to meet on a dark street. The narrative swaps between the viewpoints of Davie Gray and his girlfriend, Marie, and it steadily builds up the tension as you start to realise there is a very real problem in town and you start to turn the pages that bit faster. The darkness within and the relationships between some of these characters is just sublime. She manages to weave everyone together masterfully without you really noticing, until the end where you are left reeling. If you are a fan of the psychological crime novel, this is a read for you. Holliday has upped her game and I’m really looking forward to the next book in the Banktoun series. I agree totally with your comments on Wllow Walk. I loved it. So glad you enjoyed this, Rebecca. Isn’t it great when a second novel lives up to the promise of the first? And this does sound like a good story.